Having dedicated 30 years of their lives to enriching the education of children in Southern Arizona, Allison and Jeff Spencer knew the time was right to make a change for themselves and enrich their own lives. They decided to do this in the beautifully lush and green countryside of Nuevo Arenal, in the Guanacaste Province of Costa Rica. “We decided to move to Costa Rica for many reasons,” says Allison. “We thought we’d like to do something really different once we retired. We wanted to challenge ourselves, so learning a new language and integrating into a new culture seemed like a good way to do that.” They found that they were drawn to Costa Rica for its stable government, zero military presence, and its strong focus on clean energy. “Jeff’s brother and his wife were moving down and we love being near them,” Allison says. Being close to family and having a plane ride that’s only a few hours back to the U.S. sealed the deal. The Spencers knew Costa Rica was just the adventure they had been looking for. Jeff and Allison chose the quaint town of Nuevo Arenal, because it ticked many of their boxes. “We had visited other areas of the country, but Nuevo Arenal had the temperatures we preferred. There is no need to heat or cool your home here,” says Allison. 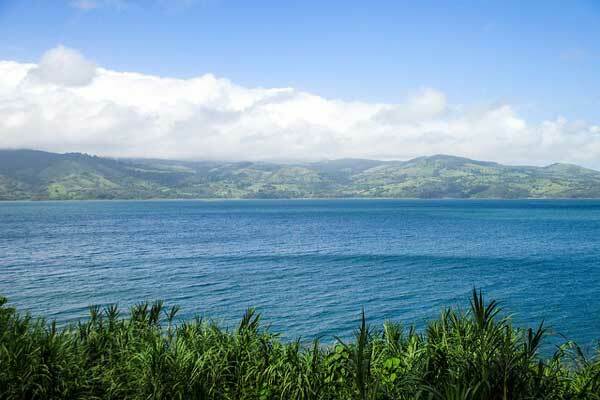 The town is tucked away on the Northeast side of the approximately 40-square-mile Lake Arenal. Besides a large, warm, and welcoming expat community, Nuevo Arenal is home to multiple grocery stores, a hardware store, a local utilities office, a police station, and a community health clinic. 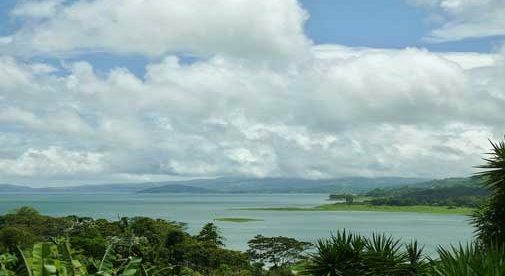 Nuevo Arenal is on the northeast shore of Lake Arenal in the northern highlands. With their monthly budget of about $2,000, the Spencers find that their money goes further in Costa Rica than it did back home. Grocery shopping is less expensive, especially if you stay away from buying imported brand names. They also find that their monthly utility costs are lower than those back in the States. The Spencers own their own custom-built home in Nuevo Arenal, but say that there are affordable local-style homes (usually made from concrete) ranging in price from $30,000 to $40,000. They admit that you’d most likely want to upgrade one of those homes. Homes that are built to North American standards can be found from a little over $100,000 to over a million, and every price point in between. Rents can range from approximately $100 for a rustic home up to $1,000 for something that’s fabulous. You can find a comfortable home rental for around $500 to $600 a month. Costa Rica also offers plenty of diverse eco-adventure activities to satisfy Jeff and Allison’s healthy lifestyle, ranging from swimming at some of the most beautiful beaches the country has to offer (like Playa Manuel Antonio and Playa Hermosa) or trekking along the Misitco Hanging Bridges located near La Fortuna (just a short drive away from Nuevo Arenal) to enjoying a hike through the Monteverde Cloud Forest. All these activities can be reached within just a few hours of one another, so there’s always something fun to do. Couple this with the close proximity of the Liberia Airport, and you can see why Nuevo Arenal offered this couple just what they needed to start the next chapter of their lives: A thriving local community, great restaurants and local shopping, a huge expat community, and lots of eco-fun to be had.